Large lot in Evansville. Manufactured allowed. Large 28,000 sq.ft. with many investment possibilities. Lot Zoned R3 with Natural Gas, Power, City Water and Sewer. Call Frank for information 307-267-8009. Up to 27,000 sq. ft. of warehouse space for lease. $6.00 a sq. ft. Heated, sprinklered, two dock high doors, two drive in doors. Ready to build! Great lot zoned for single family, multi-family and manufactured homes with all utilities available. Flat Industrial Land with water, sewer, power, gas and fiber optics. Good access to Hwy 20 and I-25. Excellent east side location. Easy access to Hwy 20 and I-25. Close to expanding east side of Casper. Residential R-3 6,263 sq.ft. Corner building lot with water, sewer, electric, and natural gas hookups. Call Frank for information 307-267-8009. Located just a few minutes north-east of Casper, Evansville, WY offers affordable housing with a convenient location! For more information call House Real Estate Group at 307-462-1985. From its beginnings in 1923, Evansville has grown to 2544 people according to the 2010 census. Evansville is located directly to the north and east of the second largest city in Wyoming. 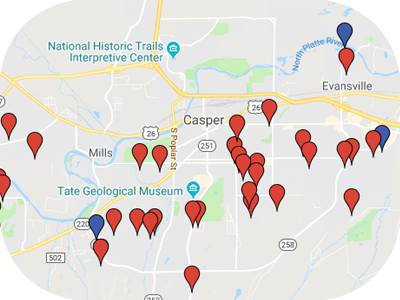 It is part of the Casper Metro Area, which offers access to Wyoming's largest airport, as well as the conveniences and the facilities offered by a larger city. Browse Evansville real estate for sale!